*Developer funds will make up any shortfall from the minimum to maximum raise. This is a new opportunity to invest in a residential project in Longwell Green, South Gloucestershire. Planning permission has been granted by South Gloucestershire Council for an additional 2 no. 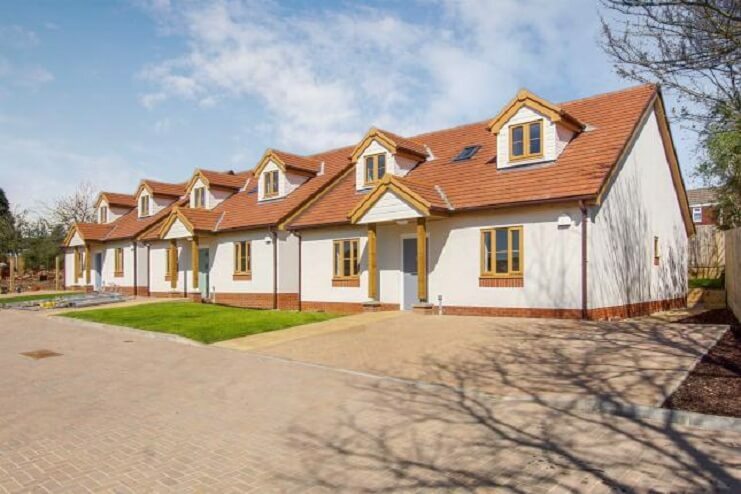 three bedroom detached bungalows with garages (Plots 6 & 7) on an existing development at Court Farm Close. With planning in place, work can commence immediately on the purchase of the property. This opportunity has a projected GDV of £800,000, calculated using agent quotes and recent comparables. The land will be purchased in a special purpose vehicle (SPV) which will be incorporated specifically for this purpose, Court Farm Road Limited. The SPV is raising £170,000 against a projected return of 28% for investors. Plots 1 to 5 at Court Farm Close have already been built as part of phase 1 and 2 of the development of which three are being kept by the developers and two being sold (currently under offer at the price expected). Plot 6 and 7 will be phase 3 of the development. Investors will be updated on a monthly basis or upon significant news flow and be invited on investor tours. Miles started the business 35 years ago. He has extensive experience in construction and property development. He has a well-established network of contacts in the construction & residential development industry. He has an in-depth knowledge of the entire construction & development business from inception to handover. Miles started his career as a management trainee for Wimpey Construction way back in 1975 and has professional qualifications in Construction. From there he started his own business renovating and converting properties. This gradually progressed to construction of new build property and land acquisitions. Miles has a consultancy role in the business now, helping to oversee all aspects of the business. He is also promoting his own strategic land interests for major scale development. In his spare time Miles enjoys many country pursuits, especially salmon fishing. He enjoys spending his weekends watching live folk music and spending time with his grandchildren. Bradley has worked in the construction/ property industry for over 10 years, since finishing university with a degree in BA (Hons) Business Studies. Bradley carries out the day-to-day management of our construction sites, overseeing the trades on site as well as being 'hands on' himself. Over the years he has furthered his personal development with a Chartered Institute of Building (CIOB) Level 4 Certificate and Diploma in Site Management. He also has other essential construction qualifications in Site Management Safety Training Scheme (SMSTS), City & Guilds Medium Risk Confined Space Work, and City & Guilds New Roads and Street Works Act Supervisor (NRSWA). Being a new father takes up much of Bradleys spare time, but previously he enjoyed travelling, scuba diving and skiing. Edward is the youngest member of the team, although he now has 10 years’ experience in the industry. He started in the construction side of the business at the bottom and has worked up to project managing the full build phase of our previous developments. Edward is a member of the Chartered Institute of Building (CIOB) and has qualifications in Site Management Safety Training Scheme (SMSTS), NPORS Excavator and Forward Tipper Dumper Licence, City & Guilds Medium Risk Confined Space Work, and City & Guilds New Roads and Street Works Act Supervisor (NRSWA). He has now shifted focus to explore his true passion of identifying and securing projects for our development pipeline. Edward is responsible for the planning & pre construction stages of our developments which he navigates with our trusted professional team to produce viable and profitable projects for Beaumont Homes to develop. Edward is taking the lead with our digital offering and hopes to push the business to new levels. In his spare time, he enjoys many country sports, as well as off road motor biking. Charlotte has worked in the business for 15 years and deals with all aspects of the project management and administration side of the business, including creating and monitoring construction schedules, problem solving 'bottle necks', monitoring cost schedules, and contract administration. Her project management skills ensure we keep our projects on time and within budget. Charlotte has a first-class degree in BA (Hons) Business Administration. Charlotte spends most of her spare time running around after her young children. She enjoys cooking and putting on dinner parties for friends and family. Cook & Co Solicitors, Butler & Young Building Control, Premier Guarantee Structural Warranty, Richard Jackson Engineering Consultants.